Up to 80% of the humanitarian supplies, fuel and commercial goods on which they depend are delivered through the facility. UN officials have warned that the toll in lives could be catastrophic if it is damaged, destroyed or blocked. The offensive on Hudaydah, which is led by the United Arab Emirates, began in June. 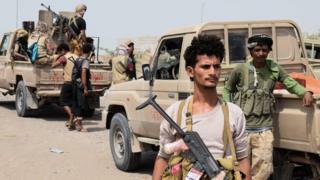 Pro-government soldiers and militiamen made swift progress initially, capturing the city’s southern suburbs and airport. But they did not push into the city centre, where rebel fighters set up sniper positions, dug trenches in streets, and laid landmines. Two hundred air strikes were reported in and around Hudaydah on Saturday alone, and aid workers say there have been intense clashes around the airport, to the east of the city, and near a university to the west. On Wednesday, Save the Children said a health facility it supports in Hudaydah had come under attack, damaging a pharmacy supplying desperately needed medicine. Meanwhile, human rights group Amnesty International said gunmen entered another hospital in the 22 May district of the city and took positions on the roof, raising the risk of air strikes against the building. “Placing gunmen on a hospital roof blurs lines which should never be blurred,” said Samah Hadid, the group’s Middle East campaign director.